• Recurrent Headaches, commonly misdiagnosed as Migraine. • Tightness in the jaw and difficulty in opening the jaw. • Pain in the jaw and in front of the ear, above the ear or at the temple radiating to the neck and shoulders.
. Twitching or tics in the eyes or face. • Clicking of the Jaw. Painful clicking or popping in the jaw joint may occur during jaw movement. • Grinding of teeth at night leading to increased wear & tear on the teeth. • Locking of the jaw in an open or closed position.
. Weakness or paralysis or pain of the muscles of the face or temple. 1. Injuries like car accidents, slaps, falls, punches, etc. 2. Trying to break hard objects with your teeth like bones, walnuts, almonds, and slipping of the jaw during the process of applying pressure. Can also happen while opening bottles with your teeth! 3. Dental work involving keeping your mouth open for long periods of time, like root canals, and extraction of wisdom teeth. ​It can also happen during general anaesthesia and in patients on a ventilator. 4. Weakness of the muscles of one side of the face due to injury, strokes, Bells palsy, Cerebral palsy etc. 5. Stress accumulates in the jaw muscles, so stressful situations can cause problems in the TMJ. 6. Ear infections on one side. 7. Chewing food or chewing gum only from one side of the mouth. ​This often happens when you have tooth pain, trigeminal neuralgia, Bell's palsy, Hemiplegia or ulcers in the mouth on one side. Combination of some of these causes can cause most of the symptoms described above. 1. Identify the causes of stress & try and tackle them. 3. 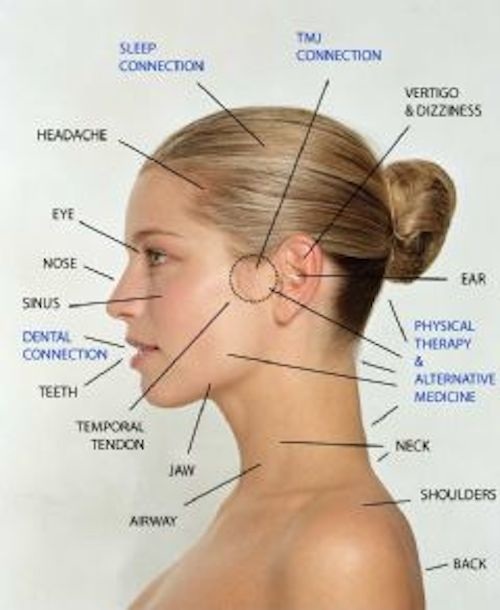 Realignment of the jaw by a cranial osteopath. I do this treatment in my Clinics’ in India. Duration of treatment: 1-2 times a week for 3 months to achieve permanent results. Temporary relief for this problem can be achieved in 2-3 treatments lasting 15-30 minutes. A permanent answer usually requires regular treatment till the joint has settled in place and the ligaments have strengthened enough to hold it permanently in place. Prevention: Close your mouth every 2 minutes while having dental treatment. Don’t bite on hard things like bones or break nuts with your teeth. This may displace your jaw. Treatment of the Tooth Damage Caused by Grinding of teeth. If grinding of the teeth has worn out the eating surface, consider coating the exposed tooth surface with glass inomer. This should protect the eating surfaces for 3-4 years following which the coating can be reapplied.